A home office serves a practical purpose. But, that doesn’t mean it can’t have a welcoming design. Whether your home office is where you run your business, study or work on the family’s finances, you can boost the appeal of this space with the help of just a few simple ideas. Spending time in your home office is all the more enjoyable with sunlight pouring into the space through the windows. One way to enhance the natural light is to paint the walls in white, beige, or a pastel colour. Light colours will reflect the sunlight creating an airy space where you can happily do your work. Putting up white curtains is another way to enhance the natural light. If the sunlight gets too hot during the day, close the curtains and enjoy the filtered light for a while. Simple white curtains can also contribute to the neat, tidy look of your office. You'll, of course, need artificial lighting, too, for those not-so-sunny days or late evening brainstorms. Be sure to choose lighting that's functional for your space, such as bright overhead lighting for times of peak concentration, but also desk lamps or walls sconces for focused projects. A classic design for a home office includes an area for work and an area for rest. The work area includes a desk, laptop, printer, desk light, and other practical items needed to get things done. Don’t forget an ergonomic chair to sit in while you’re working. The rest area in your home office can serve as a place to think, rest your eyes, or even take a nap. Consider putting a comfortable sofa, chair, or both in this part of the space. This area is sure to prompt many creative ideas so you can go back to your work area with fresh plans for your latest project. Walls painted in a solid, light colour such as white or pastel blue give a home office a classic look. In addition, light walls can make the space appear bigger and the neutral look is non-distracting, ideal for a workspace. Walls painted in a solid colour serve as an excellent background for prints, framed photos, or any other artwork you want to include in the space. The artwork on the walls of your home office can contribute to the pleasant tone of the space. Select a few meaningful pieces such as a framed picture drawn by your school-aged child or a watercolour print with a peaceful scene. To bring harmony to the décor, try to choose pieces of artwork with colours in them that echo other colours in the room. When choosing your artwork, put the pictures in a variety of frames. For instance, one picture may have an elegant silver frame while another has a carved wooden frame. Picture frames with a mixture of designs, materials, and colours, add interest to the décor of your home office. One classic design idea is to choose carpeting in a different shade of the colour on your walls. For instance, if you paint your walls pastel blue, you may consider a silvery blue for the carpeting. Once again, this is an easy way to draw together the different features of your home office. If you decide to paint your walls bright white or beige, go with ivory or off-white for your carpeting. This design choice gives you the opportunity to select some colourful artwork to bring some pizzazz to the light coloured background of your home office. 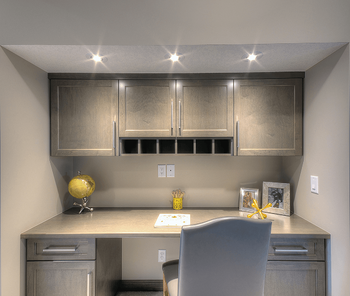 While creating your attractive home office, keep in mind it should also meet the needs of your work routine. As you sit at your desk, reach for the printer, various supply drawers, laptop, telephone, fax machine, etc., all of the office equipment you work with should be within arm’s reach to make your tasks easier. 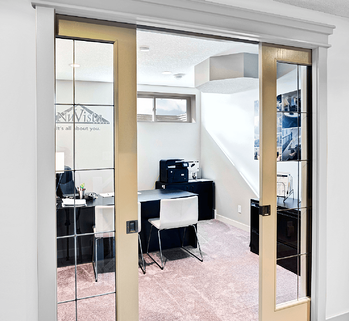 Leaving open spaces in your home office design prevents the room from feeling cramped. Be sure to leave space between your work area and your rest area. Also, leave some space between your desk, bookshelves, and the windows to avoid blocking any natural light from entering your office. Creating a classic design for your home office allows you the freedom to make small changes to refresh the décor whenever you want. With this design, small changes here and there can make a big difference. Plus, you have the peace of mind of knowing you won’t have to redecorate the next time a new trend comes along!